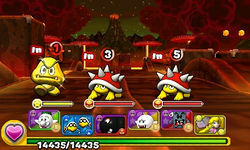 World 7-8 is the tenth course of World 7 in Puzzle & Dragons: Super Mario Bros. Edition. It is a basic, volcanic level with enemies consisting of Red Koopa Paratroopas, Red Koopa Troopas, Spinies and Coin Coffers. This course is unlocked by taking the secret exit in World 7-7. This level is straightforward, consisting of four battles (with two Coin Coffers of any color on the third battle), then a boss fight at the end with a Purple Coin Coffer. Sometimes a second or even a third Coin Coffer of any color may appear in the boss fight. Gold Goombas can appear in this course, but very rarely. The player has Fire, Water, Light, Dark and Heart Orbs on the Orb field for this course. ★World 7-8 is a difficult version of World 7-8 from ★World 7, with Wood Orbs appearing on the Orb field while Water Orbs do not. 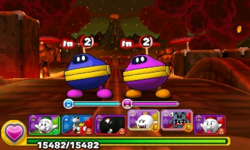 The third enemy wave contains three Coin Coffers of any color instead of two, and the boss fight at the end now has a King Purple Coin Coffer (though a second King Coin Coffer can appear in the boss fight). When joining other enemies, Coin Coffers' XP and Coin values change: the player is rewarded 4124 XP from a Red Coin Coffer for the second battle, and 3233 XP from a Green Coin Coffer for the fourth battle. For both battles, the Coin values change from 50 to 34. A rare Gold Goomba sighting on the second battle. This page was last edited on January 9, 2018, at 13:53.